We are a reputed Karachi based Manufacturer and Supplier of a wide range of Wooden Boxes. 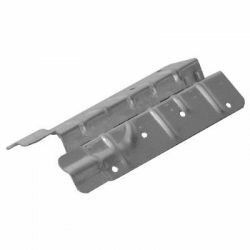 Various sizes can be manufactured to suit the specific transport requirements as well varying wood thickness depending on load weight. These products support the weight of your goods while protecting them. They can also be used to unite smaller goods for both protection and organizing purposes. 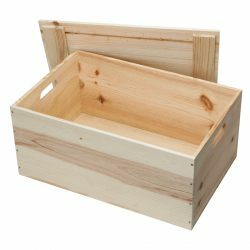 The difference between a box and a crate are that boxes have no gaps in between slats of wood and crates have open gaps between slats. 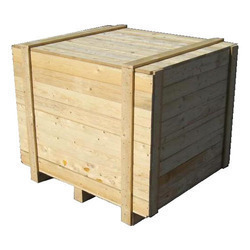 JK Pallets expertise lies in offering Wooden Crate to our clients. It is known for its excellent quality and texture. This has sufficient space and is designed in excellent manner. It has been finished in impeccable manner. Quality controllers do complete inspection of this before dispatching this in market. It is available in different dimensions to our clients. It resembles a cage like structure; ventilation between them will help in keeping the product fresh for a longer time period. To suit the ever growing needs of customers, we also manufacture small Wooden Crates for easy handling with more storage capacity. Customized needs of the clients are also entertained by the company. We hold expertise in offering high quality Plywood Boxes to our clients that are specifically designed to cater to diversified packaging needs of our clients. We make use of superlative quality wood in the making of the Plywood Boxes and we design these Plywood Boxes installed with advanced features. 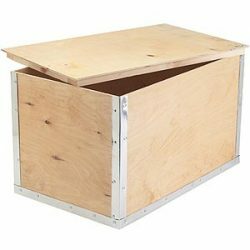 Consequently, we are recognized as the most eminent manufacturers and suppliers of Plywood Boxes from Pakistan. Our wide range of Plywood Boxes is highly appreciated by our clients for their special attributes. 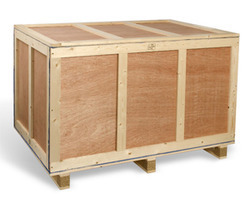 Our Plywood Boxes ensure safe handling and transportation of the materials stored and are highly durable and reliable. Being made out of premium quality raw materials these Plywood Boxes are stiff and have good puncture resistance. Our light in weight Plywood Boxes are the most preferred choice for being clean and hygienic. The high capacity and water resistance of our exclusive range of Plywood Boxes distinguishes them from their counterparts available in the market. We are firmly stuck to our policy of maintaining professionalism in all the processes from procurement to production of the Plywood Boxes. We adopt latest concepts for designing and developing the Plywood Boxes and provide prompt services according to the customer’s satisfaction level. Last, but not the least, we have the entire required infrastructure to support us for supplying any quantity of Plywood Boxes. 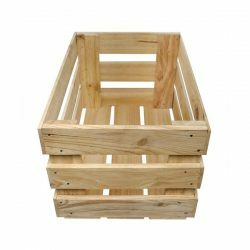 These strong and durable Collars & Hinges Wooden Pallet Boxes are a great way of storing and dispatching goods. You can build them to just the height you need. They also reduce the risk of manual handling injuries, by allowing the sides of the container to be adjusted gradually as products are placed inside, thus eliminating the need to bend over high bin sides. Supplied with hinges on the corners, so they can fold flat when not in use. 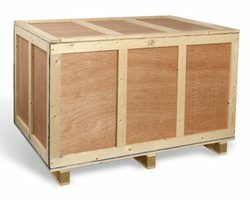 Collars & Hinges Wooden Pallet Boxes are most often used in the transportation of components for industrial goods. With pallet collars you can build up containers of diverse heights. It solves the long-term need for transportation packaging that suits the transport of different sizes of products at different times. 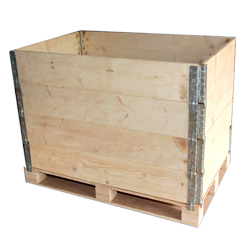 Collars & Hinges Wooden Pallet Boxes can be built up around product size. 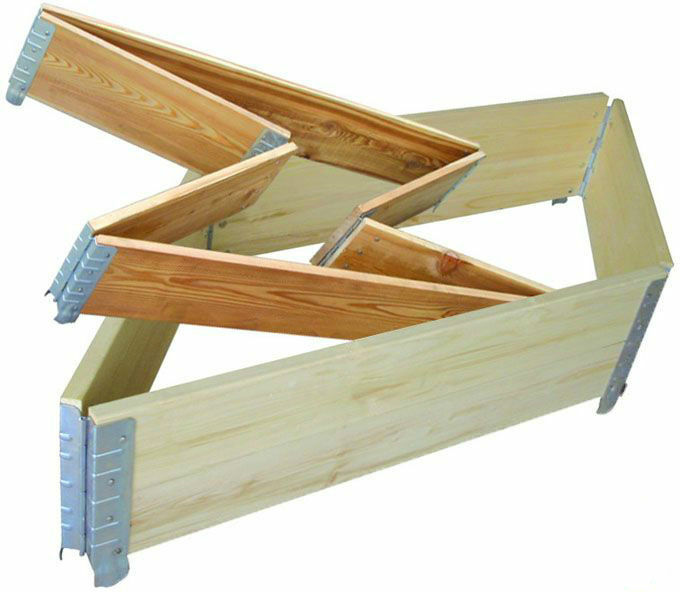 The length and width of the wooden collars is according the dimension of pallet, and the layer number of pallet is based on the height of the goods, wooden collars increase the utilization ratio of its space maximally.